Transitioning to middle school can be quite difficult. You’re not only the teacher, but you’re also the parent. Sometimes teenagers can resist their parents, so it’s important to know these 5 things to expect when homeschooling your middle schooler. There will be difficult days. Your agreeable young student is now embarking on hormonal changes. There may be times that they want to go to traditional school, question why they’re homeschooling, and want you just as a parent, not a teacher. Accept that there will be challenges, but keep conversations open to the why of homeschooling. Let your child know why this decision is best for your whole family. They will want more choice, and you should let them have it! Students in any school setting will start to want more choices in how they demonstrate their learning. One of the advantages of homeschool is that you have more options of differentiating instruction for your student. If the objective is to show they understand the causes of the civil war, allow them to choose the product to demonstrate that knowledge. Maybe it’s in a video, Google Slide presentation, or a model of a battlefield. The possibilities are endless, and your child will feel more ownership in their learning when they have choices. They’re thinking of the future. When you start to talk to your teen about college and career planning, you may not get a lot of definitive answers, but know they are thinking about their future. Allow them to explore career goals as part of the curriculum and schedule. Even if a possible career interest seems like a hobby right now, it may turn into a path. If your child is interested in cooking, add some cooking lessons into your math and science curriculum. If the military is a path they are considering, set up some visits to nearby bases or talk to recruiters or JROTC programs in the area. They’ll rise to high expectations. Teens want to be challenged, and when you’re the parent of your student, they want to know that you believe they can live up to the challenges you provide as a teacher. Your child will rise to the expectations you set forth for them. Make them realistic, but set goals together. Tell them you expect nothing less than their best, and if that’s what they’re giving, it will always be enough. Play time will still be important. From PreK-adulthood, play is pivotal in learning. Students explore and learn so much by having free time to just play. Allow your middle schooler to continue the path of play by looking at after school activities (sports, for example). There may be local club teams or you can look into options with your local public school. Free play can also be integrated into the school day by letting your middle schooler ask questions and research topics of their own choosing. This may seem like schoolwork, but going beyond the text certainly showcases the power of inquiry and play! Congratulations on homeschooling a middle schooler! 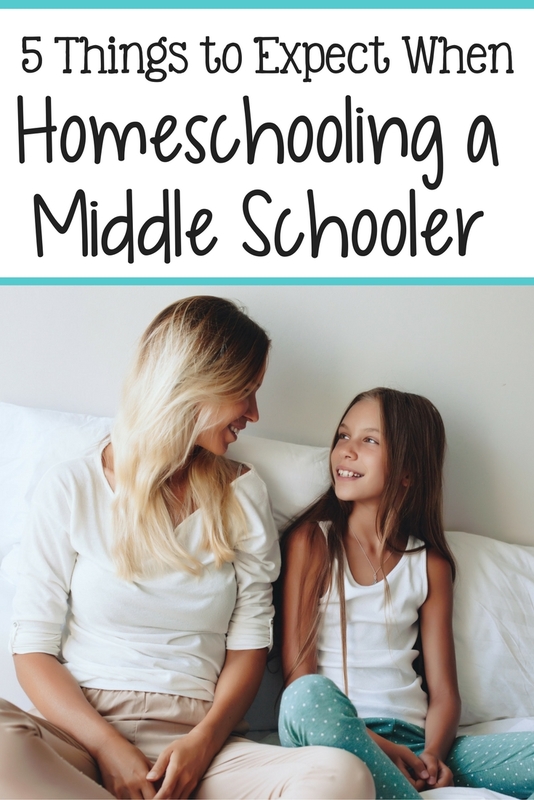 The journey may be a challenging one, but if you keep in mind 5 things to expect when homeschooling your middle schooler, you will have a successful school year and beyond! Homeschooling Middle School – Don’t Forget PE!